Beer Or Sugar Water? For Flies, The Choice Is Pale Ale If a fly walked into a bar, he'd chose beer, and scientists think they've figured out why. The secret? A molecule that tastes sweet but isn't sugar. The research could help create more powerful insect repellents. 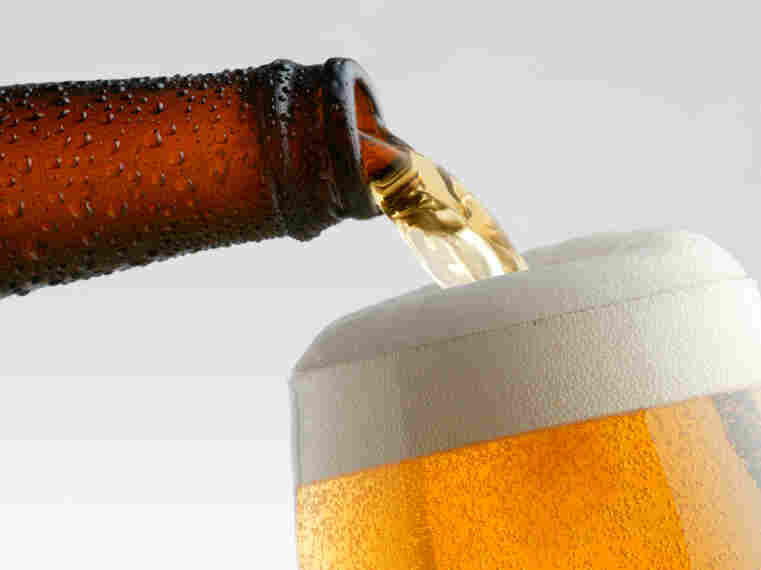 Scientists in California think they've figure out why flies like beer. That may sound a bit trivial, but in fact it could lead to new ways of combating plant and animal pests. That flies like beer is well known. "The attraction of flies to beer was first reported in the early 1920s," says Anupama Dahanukar. She's part of an inter-disciplinary program involving neuroscience and entomology at the University of California, Riverside. She's been studying how flies recognize chemicals, so answering the question of why flies like beer is actually quite relevant to her research. It's not a simple question. Scientists are only just beginning to understand the basics of smell and taste in humans, so research on flies has been extremely helpful with that. "We selected a pale ale, and the main reason was because pale ales have very lower sugar contents," says Dahanukar. "So we were trying to identify other chemicals — chemicals other than sugars that taste good to flies." Zev Wisotsky, a graduate student in Dahanukar's lab, actually performed the experiment. "I remember it was a Saturday," he says. "I grabbed the beer at the grocery store, came into the lab, and performed the two-choice assay." The two-choice assay forces the flies to choose between a sip of beer and a sip of sugar water. The flies went for the beer. Now that that was established, Wisotsky and Dahanukar went about trying to figure out which compound in the beer was attracting the flies. "The answer, as it turns out, was quite simple," says Dahanukar. "It's a molecule called glycerol, which is made by yeast during fermentation." Glycerol is the stuff that's used in antifreeze. It actually tastes sweet, but it's not a sugar. Dahanukar and Wisotsky even found the particular gene responsible for flies' ability to detect glycerol. When they created flies missing that gene, and gave them the sugar water-beer choice, the flies went for the sugar water. This research appears in the journal Nature Neuroscience. Dahanukar is interested in understanding more about the genes responsible for taste and smell in flies. But others are already beginning to turn this information into powerful insect repellents. A team of scientists at Vanderbilt University has found a compound that is more powerful than anything on the market today that takes advantage of this molecular understanding of how insects perceive the chemical world.